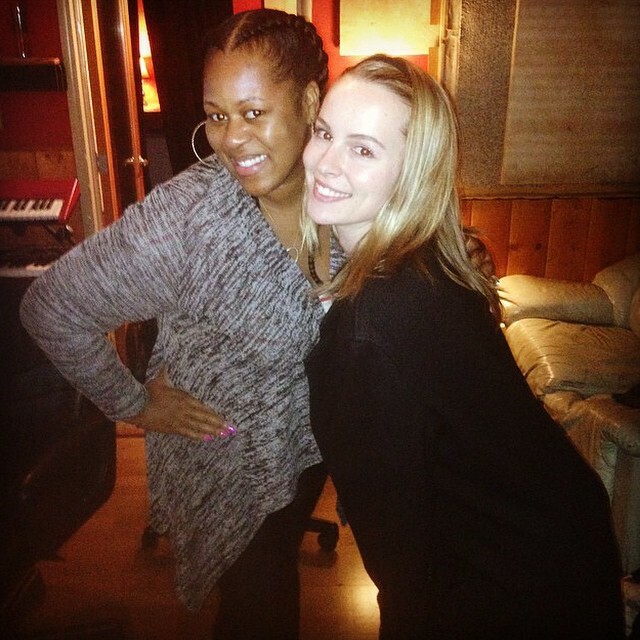 Bridgit Mendler has enlisted Makeba Riddick for her sophomore album. Riddick’s more recent songwriting credits include “Love and War” by Tamar Braxton [Epic Records], “Stay Awake” by Ellie Goulding [Polydor Records] and “Nothing Compares” by Jessica Sanchez f/ Prince Royce [Interscope Records]. Her extensive resume also includes works for Beyonce [Columbia Records], Toni Braxton [Motown Records], Rihanna [Roc Nation Records], Mariah Carey [Def Jam Recordings] and Jennifer Lopez [Capitol Records]. Meanwhile, Mendler is expected to release her next studio collection in early 2015 via Universal Music Group / Hollywood Records. The still-untitled CD is thought to feature additional alliances with Emanuel Kiriakou (Demi Lovato, Selena Gomez), Andrew Goldstein (Ne-Yo, Celine Dion), Ina Wroldsen (Jojo, Madison Beer) and TMS (Little Mix, Olly Murs). Watch the music video for “Ready or Not” below. Bridget Mendler has collaborated with TMS for her upcoming sophomore LP. The still-untitled collection – which serves as the follow-up to 2012’s “Hello My Name Is…” – is expected to be released later this year via Hollywood Records. TMS consists of British songwriters and producers Thomas “Froe” Barnes, Ben Kohn, and Peter “Merf” Kelleher. They have previously worked with Emeli Sande [Virgin Records], Little Mix [Syco Music] and JLS [RCA Records]. Some of their notable credits include “Favorite Scar” by Cher [Warner Bros. Records], “Melodies” by Madison Beer [Island Records], “Square One” by Jessie J [Republic Records] and “Recovery” by James Arthur [Syco Music]. In addition to TMS, the “Ready or Not” also teamed up with Steve Mac (The Wanted, One Direction), Ina Wroldsen (Leona Lewis, Alexandra Burke) and Sean Douglas (Jason Derulo, Nikki Williams). Watch the music video for previous single “Hurricane” – written by Mendler, Evan “Kidd” Bogart, Emanuel Kiriakou, and Andrew Goldstein – below. Singer/songwriter Bridgit Mendler has enlisted Ina Wroldsen and Steve Mac for her upcoming as-yet-untitled sophomore album. The songwriting and production duo are responsible for tracks including “That Girl” by Cover Drive [Polydor Records], “I Found You” by The Wanted [Island Records] and “We Are Who We Are” by Little Mix [Columbia Records]. Meanwhile, other notable credits by Steve Mac include “You Make Me Feel” by Cobra Starship [Decaydance Records], “A Moment Like This” by Kelly Clarkson [RCA Records] and “30 Days” by The Saturdays [Fascination Records]. Bridgit Mendler has premiered the music video for her new single online. “Hurricane” marks the second single from the singer/songwriter’s debut album, “Hello My Name Is…,” out now via Universal Music Group / Hollywood Records. The track was co-written by Evan “Kidd” Bogart, whose credits include “Criminal” by ZZ Ward [Universal Music Group / Hollywood Records] and “Hurt Me Tomorrow” by K’Naan [Warner Music Group / A&M / Octone Records]. Production duties were handled by Emanuel Kiriakou and former Friday Night Boys vocalist Andrew Goldstein, who are also responsible for “Shut Me Down” by Ne-Yo [Universal Music Group / Compound Entertainment / Motown Records] and “Thank You” by MKTO [Sony Music Entertainment / Columbia Records]. Bridgit Mendler has confirmed the title of her new single. “Hurricane” will be released as the second single from the American singer/songwriter’s debut album, “Hello My Name Is…,” which is now available via Disney Music Group / Hollywood Records. The track was written by Bridgit Mendler along with Evan “Kidd” Bogart (Christina Milian, Beyonce Knowles), Andrew Goldstein (Celine Dion, Katharine McPhee) and Emanuel Kiriakou (Jordin Sparks, Whitney Houston). “Hello My Name Is…” has debuted earlier this year at number 30 on the US Billboard 200 Albums Chart. Meanwhile, lead single “Ready or Not” has debuted at number 98 and peaked at number 78 on the US Billboard Hot 100 Singles Chart. It was later certified Gold in Canada and New Zealand. Bridgit Mendler has revealed the official songwriting credits for debut album, “Hello My Name Is…,” out now via Disney Music Group / Hollywood Records. Lead single “Ready or Not” was co-written by Evan “Kidd” Bogart (Jessie McCartney, Wynter Gordon) and Emanuel Kiriakou (Nick Lachey, Jordin Sparks). The new collections boasts additional songwriting contributions from Dreamlab: Leah Haywood & Daniel James (Nicki Minaj, Jessica Sanchez), Billy Steinberg (Paris Hilton, Joanna Levesque), Josh Alexander (Fefe Dobson, Ruth-Anne Cunningham), Andrew Goldstein (Katharine McPhee, Celine Dion), Freddy Wexler (Enrique Iglesias, Kevin Rudolf) and Priscilla Renea Hamilton (Demi Lovato, Selena Gomez). “Ready or Not” – (Bridgit Mendler, Evan “Kidd” Bogart, Emanuel Kiriakou, Thom Bell, William Hart). “Forgot to Laugh” – (Bridgit Mendler, Evan “Kidd” Bogart, Emanuel Kiriakou). “Top of the World” – (Bridgit Mendler, Emanuel Kiriakou, Jai Marlon, Laura Raia, David Ryan, Freddy Wexler). “Hurricane” – (Bridgit Mendler, Evan “Kidd” Bogart, Andrew Goldstein, Emanuel Kiriakou). “City Lights” – (Bridgit Mendler, Jai Marlon, David Ryan, Freddy Wexler). “All I See is Gold” – (Bridgit Mendler, Evan “Kidd” Bogart, Andrew Goldstein, Priscilla Renea Hamilton, Emanuel Kiriakou). “The Fall Song” – (Bridgit Mendler, Evan “Kidd” Bogart, Emanuel Kiriakou). “Love Will Tell Us Where to Go” – (Bridgit Mendler, Emanuel Kiriakou, Jai Marlon, David Ryan, Freddy Wexler). “Blonde” – (Bridgit Mendler, Leah Haywood, Daniel James). “Rocks at My Window” – (Bridgit Mendler, Evan “Kidd” Bogart, Andrew Goldstein, Emanuel Kiriakou). “5:15” – (Bridgit Mendler, Evan “Kidd” Bogart, Andrew Goldstein, Priscilla Renea Hamilton, Emanuel Kiriakou). “Hold on for Dear Love” – (Bridgit Mendler, Donnell Shawn Butler, Freddy Wexler). “We’re Dancing” – (Bridgit Mendler, Josh Alexander, Billy Steinberg). “Postcard” – (Bridgit Mendler, Josh Alexander, Billy Steinberg). “Quicksand” – (Bridgit Mendler, Freddy Wexler, Emanuel Kiriakou).